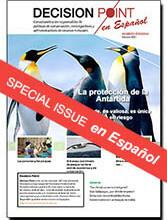 A Spanish-language series of Decision Point, featuring a blend of past and exclusive articles. Written and translated by CEED members. Además, Planificación para la conservación en tres dimensiones, Financiamiento colectivo para la conservación, y más! 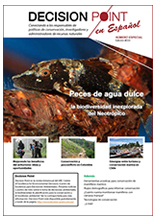 In this issue, we look at a diverse range of topics – from freshwater fish, to how the solution to preventing landslides can also conserve bird species. We investigate conservation planning in post-conflict Colombia, and ecotourism and sustainable fisheries in Chile, and more! 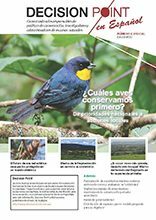 This issue features stories on bird conservation in Colombia and Europe, effects of forest fragmentation on primates, restoring marine ecosystems and Chilean marine resource management. ‘Protecting Antarctica: it’s big, valuable, unique and it’s at risk’. 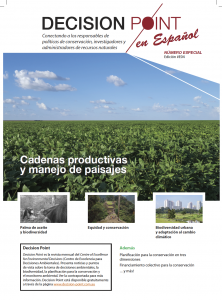 This first issue of Decision Point en Español is a careful selection of past stories translated into Spanish by members of CEED.